Protein powder is having a renaissance moment. Until a few years ago, I’d always conflated it with those enormous barrels of creatine and the ripped weightlifters that consumed them. But with the advent of athleisure and boutique gyms, protein powder has gotten a more elegant update, with many celebrities and fitness brands hawking their own intriguing options. Despite all the choices, though, I’ve felt disappointed. A bunch of the whey-based powders leave me feeling bloated (even though I’m not lactose intolerant), while the vegan mixes often taste sickeningly saccharine from an overload of artificial sweeteners. Not only was I unwilling to choke one down after a workout, but there was no way that I could even consider replacing a meal with one. 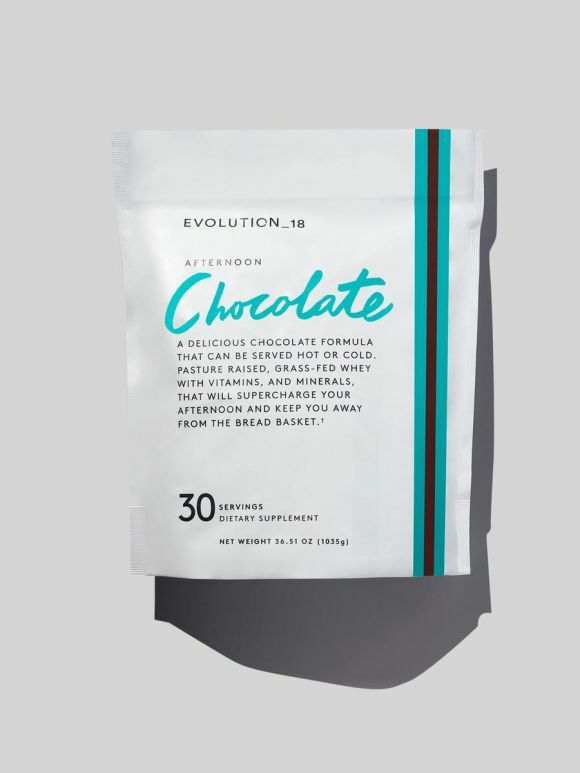 It wasn’t until I was introduced to Evolution 18’s Afternoon Chocolate ($60) that I considered protein powder a legitimate contender for breakfast, post workout, or even a snack. Evolution 18 is the latest venture of iconic makeup guru Bobbi Brown; she took her passion for nutrition and wellness and transformed it into a line of ingestible mixes and supplements meant to deliver “beauty from the inside out.” Presently, the collection consists of four items: capsules meant to strengthen hair, skin and nails; probiotic packets; vanilla collagen powder; and a whey-based chocolate protein powder dubbed Afternoon Chocolate. Each formula is mixed with buzzy ingredients like turmeric, Himalayan sea salt, and Indian gooseberry, but not for the sake of being trendy: every last spice, seasoning, and sweetener was carefully selected for their wellness benefits as well as how good they taste. And let me tell you, Afternoon Chocolate is almost too delicious. The directions advise you to mix one of the included scoop with eight ounces of milk or water (hot or cold, your choice). I first tested it mixed with almond milk and a frozen banana, and I swear that I would have believed that I was drinking a Wendy’s Frosty had I not personally seen everything go into the VitaMix. At 140 calories and 15 grams of protein for the powder alone, it is an exceptional and filling breakfast, but for the chocolate-addicted among us, it is also a true crave-satisfying snack. For those moments when I just want to tame my PMS-induced cocoa lust without consuming too many calories, I blend it with just water or almond milk. It still tastes rich, with no artificial chocolate flavor (just the real thing) and a very subtle kick from the cinnamon, turmeric, and cayenne that are mixed into the powder to help deliver a boost in antioxidant and anti-inflammatory benefits. I’ve yet to try it hot, but I can imagine it tasting like a more nutritious, less spicy version of Mexican hot chocolate. If you’re prone to tummy troubles, don’t let the whey scare you off too much. Not only is the whey grass-fed, which is said to be higher in omega-3 fatty acids (packed with health benefits for your brain! ), but the formula also includes fungal lactase. Lactase is the enzyme that breaks down lactose, the natural sugar found in milk that causes — you guessed it — lactose intolerance, hopefully making Afternoon Chocolate enjoyable to more chocolate fans. I personally never experienced the bloating and indigestion I’d experienced from other whey-based protein powders. Furthermore, it’s sweetened with coconut palm sugar and monk fruit extract, so unlike other formulas I’ve tried, I haven’t experienced a sugar crash or headaches after drinking it. At $60 for 30 servings, it isn’t the most budget-friendly protein powder option on the market, but it hasn’t stopped me from enjoying Afternoon Chocolate, especially knowing how clean the ingredient list is. Evolution 18 has transformed me from a staunch dissident to pro-protein powder, to the point that I don’t recognize myself. I’m even taking a page out of those ripped weightlifters’ books and fantasizing about incorporating the formula into different recipes, like chocolate pudding and “healthy” brownies. How much Afternoon Chocolate is too much? Asking for a friend.